We apologize you’ve landed on the most boring part of the blog! The legal dudes advised we post a disclaimer, but we will try to keep the yawns to a minimum and promise to throw in a cute dog pic and quips to keep you smiling. Let us know if you have any questions! All photos that aren’t taken by Little Houses Big Dogs are credited and linked to their outside sources and are believed to be in public domain and readily available on the Internet (published according to the U.S. Copyright Fair Use Act, title 17, U.S. Code). No animals were or are ever harmed in the making of this blog, but maybe a few clutsy homeowners/bloggers who did not take the right safety precautions did. (Namely us) If anything, we are likely accused of over spoiling our “kids with fur”. WARNING: Our various home improvement & projects, decorating methods and how to’s on Little Houses Big Dogs are not error proof. (This includes grammar errors as well!) We’re not professionals, therefore be advised that you take extra precautions and research all projects before you start them. Little Houses Big Dogs are not responsible for your personal safety or the outcome of your home improvement projects and attempts. Therefore if you or your pets are injured attempting something you’ve seen on our site, or if a project doesn’t yield the results that you intended after following our tips, Little Houses Big Dogs is in no way liable. Any photos not credited to an outside source have been taken by Little Houses Big Dogs and are the rights protected. Failure to link back and credit our site as their source constitutes a copyright violation. Duplicating any of our text (even if it’s credited to Little Houses Big Dogs) is not appropriate since Google Rankings will index the text as repeat content. Instead paraphrase, summarize, or link to copy on our site as opposed to cutting & pasting it, which is strictly prohibited. The design and layout of this blog is the sole property of Little Houses Big Dogs. Copying or mimicking our appearance (ie: duplicating our layout, posts, content, and imitating our header) is strictly prohibited. By submitting your home/project/before & after photos to Little Houses Big Dogs via email, you’re granting us permission to use those photos and information in any way that we choose unless otherwise stated in your initial email. At this time Little Houses Big Dogs is not sponsored, nor receives reimbursement for this blog. We just share because we love to see other homeowners save money and find inspiration. Little Houses Big Dogs does not accept payment for in-post product features and only posts about something because we or the dogs liked it, not because we need to pay the bills or more dog treats. We do not accept courtesy, free samples and/or blogger discounts of any kind. As much as the dogs want more treats, toys, and swag we have to keep the spoiling to a minimum. We may facilitate giveaways for charities, but don’t actually give the product away. We also don’t mail any prizes (the company or non-profit who sponsors the giveaway is responsible for that). Therefore we can’t be held liable for any prize that isn’t received since we’re not directly involved with the prize’s shipment or delivery. Any issues involving the shipment, delivery, receipt, (or quantity, quality, etc.) of a prize must be taken up with the company who sponsored the giveaway directly. Comments are manually approved, so they may not be visible right away. Little Houses Big Dogs posts and approves comments on the weekends and evenings as not to interfere with our day jobs. Occasionally our spam filter accidentally chases off a fabulous comment like our dogs after squirrels. We count ourselves and our dogs as very blessed which is why we always want to give back. We make annual and monthly donations to various cancer treatment centers, non-profit dog rescues and churches. We hope someday to gather a readership strong enough to perpetuate sponsorships of non-profits and create a community of giving. Awesome! 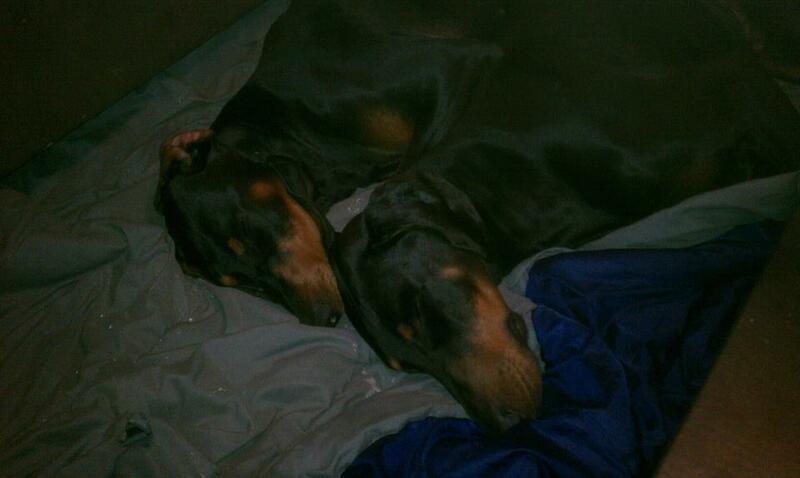 Did you fall asleep…We know the dogs did! Don’t forget to spread the word about Little Houses Big Dogs, our dobes love the attention!